When Argentinian women strike tomorrow, they'll do so in resistance to a terrifying wave of femicides. The March 8 Women’s Strike will bring women all over the world together, showing us possible connections within an emerging women’s international. In this regard, Latin America offers us an important model. The region’s revitalized feminist movement has pushed past old boundaries, aligning itself with the environmental movement, labor unions, and struggles for expanded sexual, economic, and social rights. It has effectively withstood a neoliberal onslaught that has, for the most part, neutralized the region’s progressive forces. 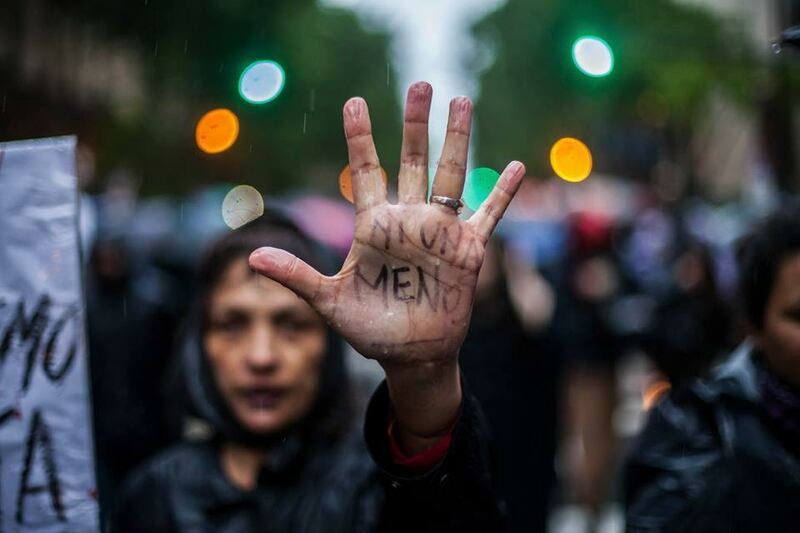 The Ni Una Menos (Not One More) collective, a continental alliance of feminist forces, will participate in the March 8 action, which will be the second women’s strike in Argentina in less than a year. Born in 2015 in Argentina as a campaign against gender violence, Ni Una Menos has become a political counterbalance to what many now acknowledge as a region-wide war against women. This movement helps us see how a global movement for women’s liberation can connect with calls for economic and social justice. Agustina Santomaso spoke with Verónica Gago on the eve of the International Women’s Strike to better understand how the event is taking shape in Latin America. Can you tell us a little bit about the history of the movement in Argentina? One of the key precedents for Ni Una Menos is Argentina’s National Women’s Meeting, now in its thirty-second year. The meeting has become the largest event of its kind — seventy thousand women attended last year’s three-day conference. Because of the longevity and frequency of the meeting, it has become a space where the women’s movement has been able to develop in light of shifting political contexts. The clearest instance of this was at the 2003 meeting with the participation of the piqueteras, the movement of unemployed women that had been organizing neighborhood assemblies and street demonstrations against neoliberalism for years. From that moment on, the Women’s Meeting became a mass phenomenon, and increasingly Latin American in its scope. You find women coming from Peru, Colombia, and so on. It’s become a special moment for women to come together and share experiences. The Mothers of the Plaza de Mayo also form an integral part of our genealogy. These women, the mothers of the victims of the military dictatorship, started confronting state terrorism in 1977 and remain one of Argentina’s most important human rights organizations. We look to them for an example of politics where women are the protagonists; the tactics they used, street occupations and so on, are still important today. This is our way of tracing the current movement’s genealogy, of thinking about the current struggle in relation to a feminist tradition that, of course, goes back to the beginning of the twentieth century. New generations have to find fresh ways to relate to that tradition, to the ancestras, as we sometimes say, and discover the elements of that inheritance that provide strength in a given political context. It’s an idea that comes up often in the assemblies of Ni Una Menos, an idea that basically contradicts the notion that these strikes and actions are spontaneous: recognizing our own part in a larger tradition, assuming responsibility for that legacy, and historicizing our own movement. To cite a recent example, in an assembly held last week with the women of the Confederation of Popular Economy Workers (CTEP), we saw the piqueteras’ daughters attending, the daughters of that anticapitalist movement from the early 2000s. This shows a commingling of temporalities and generations that is really powerful. One also thinks of the National Campaign Against Violence Towards Women and the National Campaign for the Legalization of Abortion in Argentina. These campaigns also have a significant historical trajectory and their own structures. Exactly, those campaigns have been sustained over the years through militant participation and concrete demands. Today we’re seeing a convergence of different tendencies — not some spontaneous movement that appeared out of thin air. The current moment is actually the fruit of accumulated experiences, discourses, street tactics, and community activism, which of course all find expression within the current political context. March 8 will be the second women’s strike in Argentina in less than a year: the first took place on October 19, 2016. The event that triggered the first strike was the murder of a young woman — a femicide, to be precise — but the specific issue of gender violence quickly assumed an economic and social dimension. Lucía Pérez’s murder occurred during last year’s Women’s Meeting, so the violent nature of the crime felt like a reaction against such a clear manifestation of women’s autonomy. The fact that Lucía was murdered by impalement also recalls, as Rita Segato has pointed out, a particular kind of colonial imagery, a reactivation of the colonial inheritance in Latin America. And the crime was committed on the eve of Columbus Day, no less! So I would argue that there is some type of collective unconscious that is being exorcised on women’s bodies through this kind of violence and cruelty. This was part of the background against which the October 19 strike took place. I consider the intersection of gender violence and economic and social issues a huge step in the right direction. The idea itself began to take shape through the assemblies that ultimately issued the call for the strike action, when it started to become clear that by striking we would leave behind the logic of victimhood. Naturally, there was a need for mourning after Lucía’s murder, but the time had come to make a demonstration of our collective power in the streets. Of course, underlying all this there is also a certain ambiguity. They’re killing women all over the place, but as that’s happening, women are the ones controlling the streets, the ones exercising a kind of power that has to do with the struggle over our bodies’ autonomy. By combining these considerations with the strike tactic, the action assumed a different connotation. This was especially evident in the period leading up to the demonstration: we drew a lot of attention by calling it a strike and declaring that we would perform a work stoppage in whatever place we might inhabit — be that at work, at school, in our neighborhoods, or on our streets. Even more, incorporating workers from diverse sectors of the informal economy, the shadow economy, and the domestic economy sent a powerful message: it pointed to an actual site where violence could and must be stopped. Equally so, it made an important statement: the men who commit gender violence are not psychopaths or isolated cases, nor is the media responsible for the way they behave. There is a whole sociopolitical and economic framework that we need to understand in order to better see how women’s bodies are converted into a territory subject to conquest (hence the reference to the colonial question). As Rita Segato says, there is a war being waged against women in Latin America right now. But it’s important to repeat: we can no longer think of these acts of violence as isolated incidents, as pathological cases, or “crimes of passion,” as they’re commonly called here. What is the best way to articulate the connection between neoliberalism and patriarchy? How does neoliberalism enlist patriarchy in its service? The debate around neoliberalism helps us see the battlefields on which subjectivities are being formed and on which women are being subjected to exploitation through multiple forms of precarity. Another angle worthy of our attention is how the exploitation of men in the workplace reappears in the domestic sphere as violence. This flaring up of domestic violence is significant: for the last two years in Argentina, if not longer, people have been wondering when the whole political situation will explode, remembering the massive social revolt that took place in 2001. Once again, we find ourselves in the midst of a social and economic crisis. My own reading of neoliberalism, however, tells me that what we’re now seeing is an implosion rather an explosion, and that this is aimed at the domestic sphere. In 2000, there were powerful social movements that could take decisive action within the community, but today there are other forces at work trying to manage the crisis in their favor. Today’s social movements have effectively been deactivated — when they’re not actively repressed — because they’re forced to work within this oppressively conflict-ridden scenario. This victim-based analysis is very weak because it doesn’t allow us to see that the assault on women is really a response to the different types of autonomy that women are pursuing over and against this broader social scenario. Clearly, it is difficult to attain any sort of autonomy when women are being beaten at home and have no income of their own to escape that situation. What would it would mean to overcome the “ghetto” of victimization, especially in light of the statement made by Nancy Fraser, Angela Davis, and others, calling for a strike in the United States and for a rupture with “neoliberal feminism”? Do the ideas formulated there make sense in the Latin American context? In other words, is there a kind of feminism that we should be rejecting here, too? The case of the United States is interesting. What stood out for me in the January Women’s March was the voice of the African-American women, as well as the acknowledgment of the Sioux and the indigenous struggle. I get the impression that the discussion around neoliberal, white feminism is very complicated, although we are following that debate here in Latin America. On a general level, we are seeing the emergence of a broad-based, popular feminism. Put differently, while feminism represents a very important and interesting tradition, its aspirations have often been academic, elitist, or just plain corporate — in any case more restricted in its ambitions. Which is not to detract from the fact that there is a long, rich history of struggle that can still guide us. But I think we are witnessing a new kind of feminism, a feminism of the masses. In Latin America, there is a very interesting discussion taking place around the idea of community-based feminism, or popular, communitarian feminism. In practice, this has meant that feminism has taken part in the struggle for community control over territories, the defense of natural resources, and so on, which is all clearly part of the indigenous and peasant struggle. But it is important to highlight that this communitarian feminism is just as much present in the urban centers, lest we romanticize it. In Latin America, the present moment is defined by the appearance of this feminism of the masses. The word feminism used to provoke a sense of unease. I remember spending time among the popular sectors of Buenos Aires and hearing the women there describing a set of political practices that struck me as feminist, but they didn’t see themselves in that light. That’s no longer the case. It’s no longer the case in the Villa 1-11-14 [one of Buenos Aires’ larger informal urban settlements], where cases of domestic violence are now being approached from a feminist understanding, or in Argentina’s provinces, where an array of political practices are developing and growing stronger under the feminist banner. This was not the case in the past. Feminism wasn’t regarded as capable of adding anything to our political practices, or being particularly useful in terms of framing experiences, narratives, or tactics. That’s all changed. It seems that the current feminist movement in Argentina has managed to achieve a certain unity in diversity that has proven elusive for the broader left. Absolutely. The movement has made diversity a strength rather than a weakness. It’s an extremely complicated task, but it just goes to show that the movement is sincere in its ambition to meet the challenges offered by the current social reality. For example, among the principles we’ve established for the March 8 strike is the idea that feminism is capable of constructing its own genealogy; that is to say, through feminism, one can produce a feminist understanding of labor that would lead you through a whole discussion of the informal sector, the formal sector, and so on. Effectively, you decenter the historical idea of March 8 — the date commemorating the death of women in the factory — by shifting emphasis to the present moment, where women are not only dying in factories but also being murdered in their own neighborhoods. This becomes a question of mapping the terrain of the popular economy — that is, the economy of all those excluded from the formal sector — and coming to a better understanding of other forms of exploitation that feminism can also illuminate. How do we relate the femicides in Latin America to current forms of exploitation and value extraction? How are these murders giving way to new kinds of struggle? Autonomous bodies and sexual dissidents — this is the other principle that we have established. This principle acts as a charter for producing subjectivities, for connecting territories, and for building community. There’s something interesting in this relation between the intersection of subjectivities and the desire for a community — community understood not as something complete, the ever-romanticized, mythical community to which we are always trying to return, but as the desire to be together and, through being together, constituting political power. Here too, the act of occupying the streets is clearly important. There is a dispute over who controls the streets, where occupying the streets produces a collective strength that you can bring back with you — to the neighborhood, the schools, the university, and so on — as a kind of mark that recalls a type of collectively built strength. The connection between these street demonstrations and the everyday organizing work taking place in different sectors of society is growing stronger and producing a very powerful dynamic of politicization. Is it possible to speak of a uniquely Latin American feminism? If so, what sort of lessons might it offer for those outside the region? Comrades throughout Latin America are now discussing the incidence of femicides in connection with land appropriation, particularly in Honduras and Guatemala. We have seen murders, like Berta Cáceres’s, that specifically target women who are leading the fight against transnational capital. In these cases, we can see how Latin America’s specific contribution is toward a better understanding of how this new kind of warfare is unfolding in our territories, a kind of warfare where these femicides function almost like a counterinsurgency tactic. Likewise, how this kind of warfare is reconfiguring the current terrain, forcing us to think about what it would mean to build community power and a movement where women act as the protagonists. My sense is that Latin America offers a forceful example of the issues involved in this dispute over territorial control. In Latin America, we are seeing a new feminist movement that has largely broken away from traditional political structures emerge: a “women’s vanguard,” if you will. What can feminism offer to these other political struggles? In Latin America, the Left and the resistance to the right-wing resurgence has come to be embodied in the Vatican. The shadow cast by the Pope, who very vocally criticizes capitalism on the international stage, has meant that leftist critique tends to gravitate toward his example. Meanwhile, feminism offers a woman-centered political subject with a markedly different orientation because, in the first place, it questions authority and maintains a basic attitude of insubordination with respect to existing organizations. As that’s happening, young rank-and-file women are forming internal commissions where they are pressing for the appropriation of the strike method. For a younger generation of women in Argentina, participating in the feminist movement and being active in trade-union politics are part of the same experience. Granted, for a certain part of the older leadership one can’t possibly be both a union leader and a feminist, but for the younger generation, the confluence of the two political tendencies has been astounding. Feminism today has the potential to insinuate a level of insubordination and noncompliance into all types of organizations — a type of transversal logic that cuts across all different types of institutions. As you can imagine, Angela Davis’s ideas and the concept of intersectionality have also enjoyed a positive reception here. There is a significant amount of animosity toward the strike coming from certain parts of organized labor. Argentina’s largest labor federation, the General Confederation of Labor (CGT), announced its plans for a march — not even a strike, mind you — on March 7, the day before the International Women’s Strike. The media has fallen in line, providing massive amounts of coverage for that march and the potential significance it might hold for the realignment of forces within the Justicialist Party [the Peronist party]. Meanwhile, the March 8 strike has become a sideshow, and on the rare occasion it gets some coverage, the media always seems to revert back to its fixation on the idea that these political mobilizations actually tend to aggravate gender violence. It’s as if women get to be in charge of feminism, while men are left to deal with the entire question of organized labor and “politics.” It seems clear that the increased number of femicides is actually a disciplinary strategy and a way of challenging women’s autonomy. There have been fifty-three femicides in the last forty-seven days. The numbers are actually higher than the previous year. They also tend to be serial in their logic: a series of murders by impalement, and later, three cases taking place one after another in the prisons. No one seems to care that the perpetrators go free or that femicides are being committed inside the penitentiary system. Not to mention the latest trend, femicides where the aggressor kills everyone — the sister, the sister-in-law, family members, and so on. These femicides are expressed as a kind of message — Rita Segato has called this type of message “a pedagogy of cruelty” — and the media tends to pick up on this and feed on it. The overall message is a disciplinary one. There is a strong campaign of blame in the works as we speak, one that will argue that the more women mobilize and struggle for autonomy, the worse the backlash will be. Here too the question of self-defense becomes relevant. On the one hand, the movement can make demands of the state, and no matter how limited that horizon may be, we have to continue to demand some reaction from the state. This, indeed, should form an important part of our agenda. Having said that, it’s fairly clear that absent some self-defense mechanism, some tool for collective self-preservation, there’s simply no way to alter the current course of things. It would seem that for every gesture of autonomy a new form of violence also surfaces. One of the standout topics in the months leading up to the strike was whether men would participate in the March 8 action. Do you see any signs suggesting the emergence of new subjectivities or new masculinities that could participate in building a new feminism and joining in the fight against patriarchy? The media became really obsessed with this question. There’s an age-old strategy for infantilizing feminists that basically consists of accusing the movement of being overly sectarian, and the media always runs with this. Later, the same debate reemerges in women’s assemblies, but there the consensus usually focuses on the idea that female protagonism is paramount and that the men therefore ought to step aside; or better, they ought to begin to think about how to participate in a movement where they don’t occupy center stage. The task of sorting out the role that men will play is one that men themselves will have to figure out. I’m wondering too about this global convergence that we’re witnessing around the International Women’s Strike. What can you say about the processes that are driving this confluence? Italy has one of the strongest movements. But wherever you look, you can see that it’s truly massive, with a great deal of organization and deliberation coming out of women’s assemblies all over the place. Poland represents an important precedent, and there is also action taking place in Ireland around the issue of abortion. I also get the impression that in countries like Germany, France, and Spain the event will go forward but perhaps on a smaller scale. Latin America is remarkable for the level of coordination and organization that has been achieved in the months leading up to the strike. We’re in contact with all types of organizations, feminist and otherwise, with lawyers, community organizations, high-school groups, and so on. A multiplicity of voices is contributing to the organization, and it’s created a movement that can speak in many different political idioms. For example, we’ve been talking with women from Paraguay who are at the forefront of the fight against big agribusiness and agrochemicals in their country. A multiplicity of struggles are finding a space within feminism and dragging that movement out of the ghetto, so to speak. We won’t allow ourselves to be labeled as separatist; we won’t be painted into a corner as a movement that only thinks in terms of victimhood. I don’t personally like the term “empowerment,” but there is a process of building power and experimenting with power that is important. The current moment’s transnational dimension is very heartening because it represents a logic that operates within territorial conflicts rather than at the level of the nation-state. And unlike the antiglobalization movements from previous decades, I see this current movement as somehow more embodied and full-blooded. The focus has broadened beyond the march, beyond the political event. The idea of putting on a spectacular march is still there, but one senses that a substantial social base is supporting it now. Likewise, it’s interesting to think about the current situation in Latin America in light of the women’s movement. It’s become commonplace to recognize that the era of progressive politics in Latin America is coming to an end — that we’ve effectively entered a neoconservative cycle. And yet the women’s movement proposes a different political calendar and a different type of political analysis that goes beyond the temporal frame of political cycles, operating on a level that sees past the most superficially apparent aspects of these governments. The feminist movement is actively involved in exploring topics that basically transcend the progressive/conservative dualism — topics like the latest strategies for exploiting women’s bodies, the exploitation of territories, the ideology of security as it is used to impose discipline. These and other issues allow us to shift the center of analysis and politicize areas that deserve more attention. One of the most valuable things we did over these last several months was to work with the trade unions, which gave us a better understanding of the inner workings of syndicalism. Between the October 19 action and the present, there’s been an enhanced and reconceptualized appreciation of what the strike instrument can mean. As opposed to the idea that the strike is an outdated tool useful only for a small labor aristocracy — the few who can still strike — this entire idea of the strike has been repurposed and put to work for other ends, and can hopefully even provide the impetus to rethink questions related to the nature of work and exploitation. Verónica Gago is a member of Argentina’s Ni Una Menos collective and a professor at the Faculty of Social Sciences at the University of Buenos Aires. She is the author of Neoliberalism from Below: Popular Pragmatics and Baroque Economies.